For various and sundry personal reasons, I largely avoid social-media platforms. A four-year-old article that I recently found on one, however, demonstrates how faulty the American public's understanding of its own immigration history is. Before I get to the point, let me explain why this is important. Immigration is a unique area. I have studied it for over 25 years. And my "study" has been exclusively experiential. I never took immigration in law school; instead, the bulk of my immigration knowledge has been "on-the-job training" through various government jobs and my current position as a pundit in a think tank. Respectfully, for those who pay my salary, I consider the last part to be the least important, at least as it relates to my knowledge of the subject area. Duty-attorney calls gave me a much better understanding of marriage fraud and immigration adjudications and enforcement than any research I have ever undertaken. Similarly, you can read the Immigration and Nationality Act (INA) and its implementing regulations, but if you really want to know how removal proceedings work, you have to at least see one. It is even better, for purposes of understanding how section 240 of the INA is applied on a day-to-day basis, to argue an immigration case and better yet to argue and hear thousands of them, as I have done. I have never lacked for self-aggrandizement or ego (although I realize that pride is a sin), but these observations actually go to a larger point. The Center for Immigration Studies is unusual (although not unique) among immigration think tanks in that it employs experts who have real-world experience in what they are talking about. Dan Cadman is a retired INS / ICE official with thirty years of government experience. Mr. Cadman served as a senior supervisor and manager at headquarters, as well as at field offices both domestically and abroad. Within the immigration law enforcement field, Mr. Cadman's knowledge and experience encompass, among other things, criminal aliens, employer sanctions, and national security and terrorism matters. Frankly, Cadman more than makes up in modesty what I lack. It is humbling as a lawyer to have a client who has a better understanding of the law than you do, but that was often the case with Cadman and me. In particular, I can remember appearing before the National Commission on Terrorism (also known as the Bremer Commission) in, I believe, 2000. Curiously enough, it was not a friendly crowd, for reasons that I will detail in a later post, and I appeared before it with not a little trepidation. Interestingly, the report of that commission notes that I was interviewed, but omits Cadman's name. You can trust me, though — he was there when I was interviewed, because of a very specific recollection I have. A question came up on the arcane issue of exit controls for citizens under (again, I believe) section 215(b) of the INA. Cadman succinctly explained the concept and its limitations, and provided historical reference for when it was actually used. Similarly, my colleague Jessica Vaughan served as a foreign service officer with the State Department in Belgium and in Trinidad and Tobago. This hardly does her scope of knowledge justice, as this position requires an intense understanding of the INA, as anyone who knows the State Department understands. Further, her 26 years at CIS and the contacts that she has accrued over that period of time give her an unparalleled knowledge of all aspects of immigration adjudication and enforcement. Long story short: While simply understanding the concepts of immigration will enable you to have a perfectly valid opinion about U.S. policies on the admission and removal of aliens, some real-world experience can help to put them into context. Or, as I stated in a post from August 2017 on a trip I took to the border: "On Immigration, If You Want to Know, You've Got to Go". The plural of anecdote is not data, but enough anecdotes can help frame your understanding of complex concepts. A lack of knowledge has become an issue in the immigration debate of late. Most Americans have a basic understanding of immigration, that is, that there are U.S. citizens and aliens, and that some of those aliens are here lawfully and some are not. The finer points are often not as clear as the public understanding believes, however. For example, do those here illegally perform jobs Americans won't? Many people would say yes, but in fact this question is in doubt, as my colleague Steve Camarota and his team of experts who actually crunched the numbers explained in a CIS Backgrounder last month. Not like the brazen giant of Greek fame, With conquering limbs astride from land to land; Here at our sea-washed, sunset gates shall stand A mighty woman with a torch, whose flame Is the imprisoned lightning, and her name Mother of Exiles. From her beacon-hand Glows world-wide welcome; her mild eyes command The air-bridged harbor that twin cities frame. "Keep, ancient lands, your storied pomp!" cries she With silent lips. "Give me your tired, your poor, Your huddled masses yearning to breathe free, The wretched refuse of your teeming shore. Send these, the homeless, tempest-tost to me, I lift my lamp beside the golden door! Meet "Emma," a computer-generated virtual assistant who can answer your questions and even take you to the right spot on our website. Emma is named for Emma Lazarus, who wrote the poem inscribed at the base of the Statue of Liberty about helping immigrants. Inspired by her namesake, our Emma can help you find the immigration information you need. [White House adviser Stephen] Miller added that whether the French woman would be eligible to remain in the U.S. under the Republicans' new immigration proposal was "something we are looking into," noting that the woman did not appear to speak English and that holding a torch in the air was not a skill. The underlying implication of that statement is twofold. 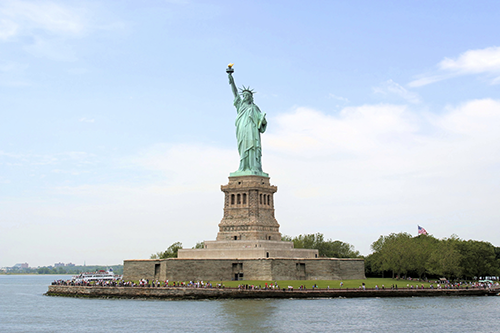 One, the Statue of Liberty has the same precedential value as the INA and its implementing regulations. Two, Stephen Miller and Republicans hate immigrants. Respectfully, the former implication is invalid, and the latter is (from my experience) untrue. In fact, House Republicans attempted to pass one of the largest amnesty bills in history in June 2018, as Vaughan noted at the time, but not a single Democratic member voted for it. All of this is a prelude to the article that I mentioned in the first paragraph above. That article, which appeared in the January 21, 2014, edition of Mosaic was captioned "Jewish Surnames [Supposedly] Explained". As that journal's website explains: "Launched in June 2013, Mosaic takes a lively, serious, and committed approach to Jewish issues and ideas." Why, O Internet, do you keep doing this to me? By "this," I mean turning unsubstantiated nonsense into articles that are then smeared across the globe. And when the fun-filled piece-of-the-week concerns something related to Jewish culture — about which a few million Americans feel a sense of ownership, and millions more feel an intense curiosity, but remarkably few have any substantial knowledge — the phenomenon can multiply exponentially. It was written in response to a separate article captioned "Jewish Surnames Explained" that appeared in Slate and elsewhere. "Jewish Surnames Explained" concludes, tellingly, with a perennial myth about American Jewish surnames: "Finally, there may have been Jewish names changed or shortened by immigration inspectors (though this is disputed)." This is like saying: "Finally, the lunar landing may have been faked to impress the Soviets (though this is disputed)." The idea that immigration officers at Ellis Island were a bunch of rent-a-cops scribbling down whatever names struck their fancy falls into the same category as Washington chopping down the cherry tree or the CIA killing Kennedy. Immigration officers at Ellis Island (and its precursor, Castle Garden) were accompanied by interpreters who were required to know at least three languages, while ancillary interpreters with knowledge of more obscure languages circulated to ensure competency — and in this context, Yiddish, German, Russian, and Polish were far from obscure. None of this even matters, though, because immigration officers at Ellis Island never wrote down immigrants' names. They obtained those names from ships' manifests, compiled at the port of origin. Nor is it possible that the same mythic scenario was enacted on the European end. Ships' manifests were recorded from passports and other travel papers, and the shipping companies were very careful not to make errors, because errors cost them money: inaccuracies were grounds for deporting improperly documented or unqualified people back to Europe at company expense. The myth about immigration inspectors randomly assigning new names to aliens who arrived in the United States and the late 19th and early 20th centuries is indeed pervasive. In fact, it is an early plot point in The Godfather: Part II, when the future Godfather, then just a boy, arrives at Ellis Island. After his family is killed, Vito Andolini travels to the United States. The wide shots and smooth, long panning of the camera through the interior of Ellis Island conveys the hectic yet systematic atmosphere of the immigration process, and Vito kind of fits somewhat strangely into this atmosphere as such a young boy on his own. The scripting of this scene really gives it its poignance. When asked his name, Vito cannot answer, and one of the immigration officers reads his name and origin (Corleone, Sicily) off of his documentation; the other immigration officer then gives him the name of "Vito Corleone," thereby giving birth to Vito's new American persona, which would later become that of a powerful mafia leader, like that of Don Ciccio, the man who killed Vito's father. It's a gripping scene, but just not historically accurate, as Mosaic makes clear. So why does this myth persist? One reason I adhere to is that it fits in with the popular narrative about immigration generally. Americans who are already here, represented by the immigration inspectors, had nothing but disdain for our immigrant ancestors seeking entry. But through their wiles and persistence, our forebears managed to circumvent the maze erected against them and achieve success in the New World. Everyone loves a Horatio Alger story — why shouldn't we have one in our own family? That such tales are inconsistent with the narrative that immigration to the United States used to be much simpler when there were few laws barring entry (as the American Immigration Council asserts in a 2016 fact sheet) seems beside the point. My own family story bears this out. According to the Twentieth Century History of Altoona and Blair County Pennsylvania and its Representative Citizens, my great-grandfather, Anton Reiser, came to the United States in 1891. He opened a butcher shop, was on the borough council, and built a house on the outskirts of town in 1897. He anglicized his name to "Andy", and I am (sort of) named after him — Anton was not a common name in Maryland in 1966 when I was born, and "Andrew" was the closest my mother could get. If you go to Hollidaysburg, Pa., today, you can visit the "historical Reiser House" (as the Altoona Mirror describes it) that he built. Why historical? Because Andy Reiser was an immigrant who was successful in business and got elected to a minor public office. Impressive in retrospect, but hardly worth spending municipal funds for. Furthermore, this myth is consistent with the argument made by immigration expansionists that certain hard-hearted government employees (including many of our elected representatives; see the New Yorker article above) have been and continue to be an impediment to the American dream. In this morality tale, anyone in favor of immigration enforcement is the bad guy. Jordan often talked of the need to strike a balance between two immigration policy values. "The Commission decries hostility and discrimination against immigrants as antithetical to the traditions and interests of the country," she said. "At the same time, we disagree with those who would label efforts to control immigration as being inherently anti-immigrant. Rather, it is both a right and a responsibility of a democratic society to manage immigration so that it serves the national interest." Sentiment and myths have their place in society. Given the impact the unrestricted immigration would have on the most disadvantaged Americans, however, the formation of immigration policy is not one of them.